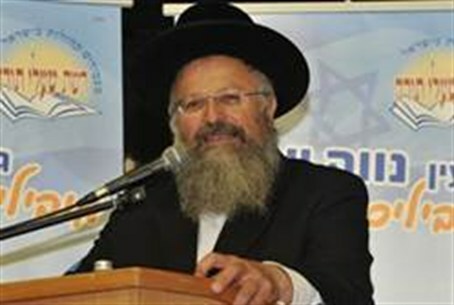 Tzfat’s Chief Rabbi Shmuel Eliyahu is urging Ichud Leumi (National Union) chairman Yaakov (Ketzaleh) Katz to cancel his offer to run in the 13th or 14th place on the joint nationalist parties’ ticket and to retain his top ranking. The party is running with the Habayit Hayehudi (Jewish Home) faction to bring a larger combined representation in the next Knesset. The two factions have a combined strength of seven Knesset Members in the present government, and Ketzaleh said Tuesday night he is so sure that that the January elections will result in 15 MKs from the combined parties that he wants to be placed number seven on the National Union. He said that would mean his being placed 13th or 14th on the merged list. He told Arutz Sheva, “If my (late) father Rabbi Eliyahu were with us today, he would force Ketzaleh to return to the leadership of the National Union. “I think that Ketzaleh is a person who works very much, and there are not many people who have the capability to stand tall for the right to establish of communities in Judea and Samaria, educational institutions and medias outlets, as well as encouraging others to be active. “Many others think as I do. His announcement is a big surprise for me and for other rabbis, I call on him to reconsider, we need people like him."